One thing that's saved our holidays is that my in-laws don't like turkey either. I suspect a lot of Americans don't really like turkey whether they eat it or not; after all, why would people be deep-frying it if turkey actually tasted good? Anyway, eight or nine years ago we started on our theme of doing something different and ethnic for each Thanksgiving, including Austrian, New Orleans, Mexican, Turkish, and Italian foods. This year's theme was Moroccan. Just to make things interesting, I decided to try to render as many of the traditional Thanksgiving foods as possible, in North African form. Except, of course, the turkey. 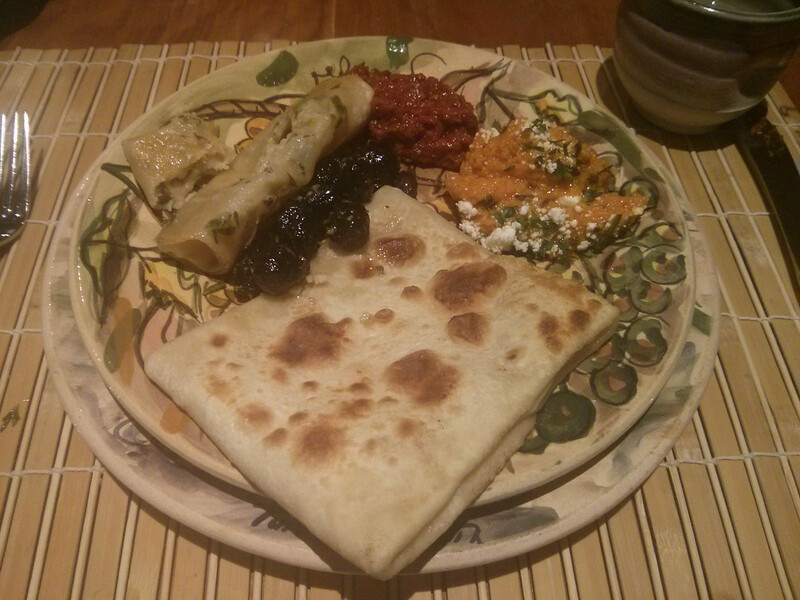 To make things even more perfect, we even had plates and other dinnerware from Tunisia. First we started with an old Thanksgiving tradition: olives. 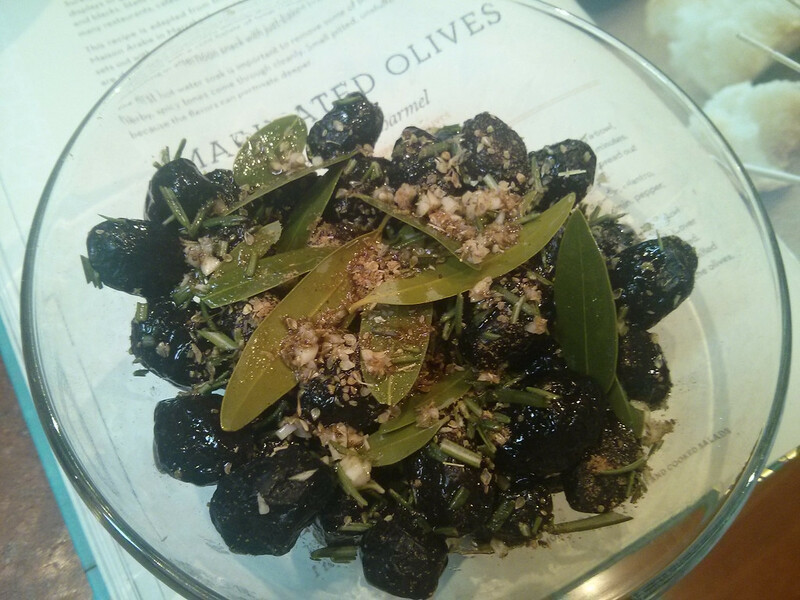 In this case, salt-cured olives marinated in spices (rosemary, garlic, cumin and fresh bay leaves) and olive oil. 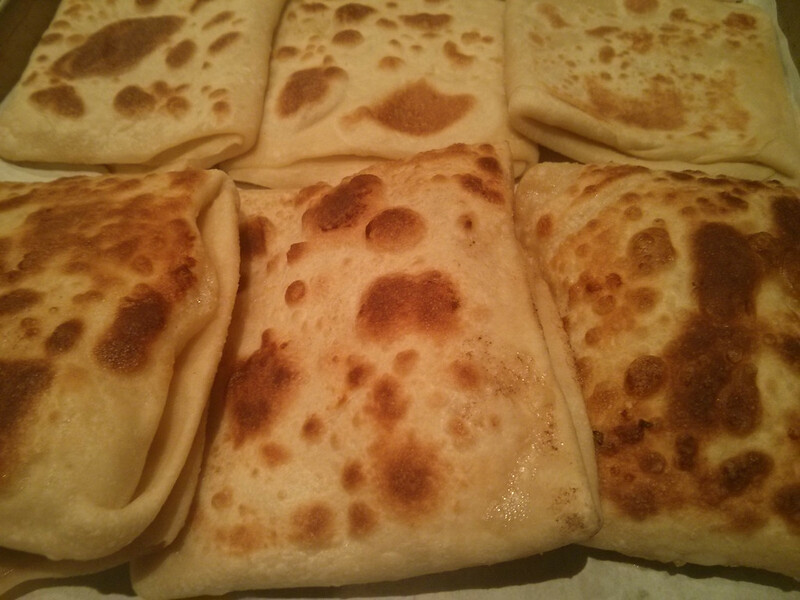 Standing in for the butter rolls or Pillsbury croissants, we have rgayif, a layered "pastry" made by the Berbers, from Jeff Koehler's Morocco. First step was rolling out the dough on an oiled mat to transparently thin; this was easier than it sounds. However, Koehler's recipe was faulty in that these really need finishing in the oven. Although my sweetie said I got them right based on her experience, I don't feel like the effort was really worth it; they were more chewy than flaky. 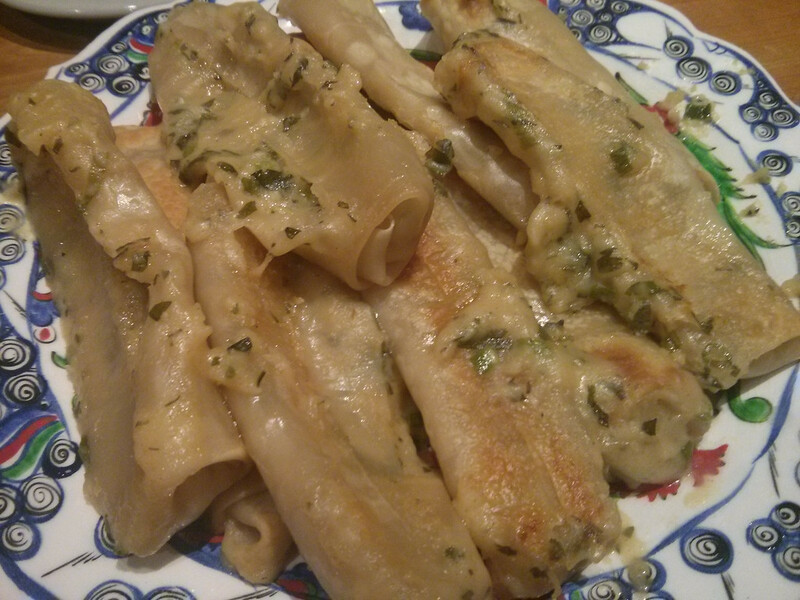 As our mashed potatoes replacement, I had intended Doights De Fatma, or "Fatima's Fingers", based on a recipe from Kitty Morse's North Africa: The Vegetarian Table. These are basically tubular pastry filled with cheesy mashed potatoes, and they seemed perfect. However, 2/3 of them exploded in the oven. I think this was my fault for refrigerating them overnight; it left too much time for the wrappers to get soggy. No Thanksgiving plate could be complete without cranberry sauce, here replaced by cranberry harissa, here served in a handpainted bowl from Algeria. 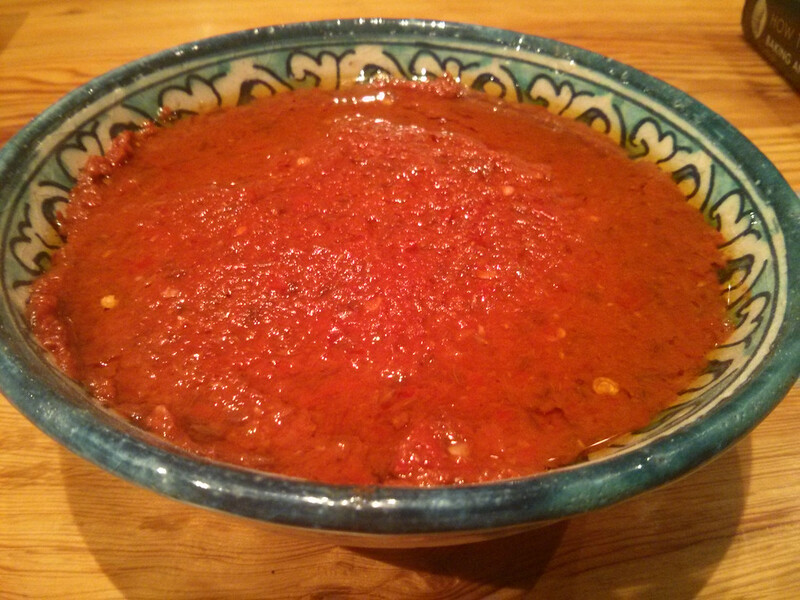 This was my own invention, loosely based on the harissa recipe from Kitty Morse. 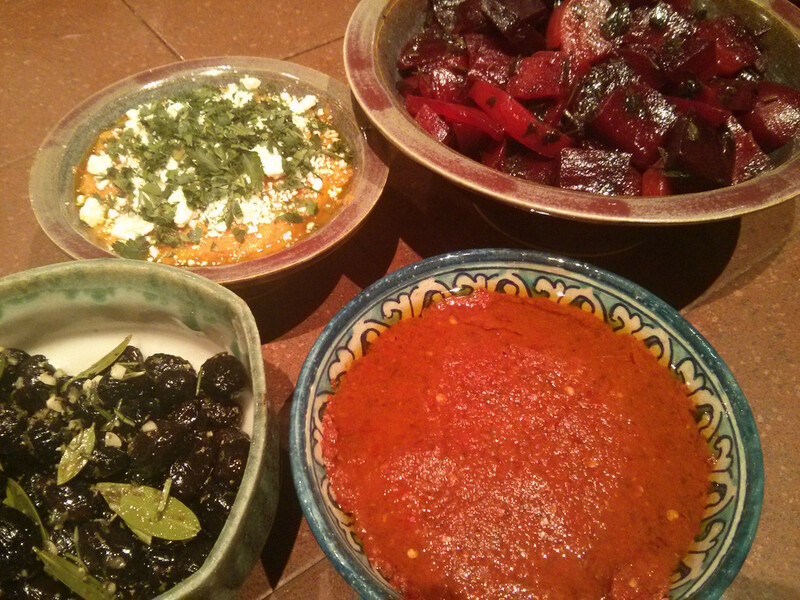 This was a success; the cranberries made the harissa just a bit different without making it overwhemlingly cranberry. I'll make this again. Roasted carrots are also a TY Day thing, and are here represented by carrot, cumin and feta "salad" from Ghillie Basan's Moroccan. 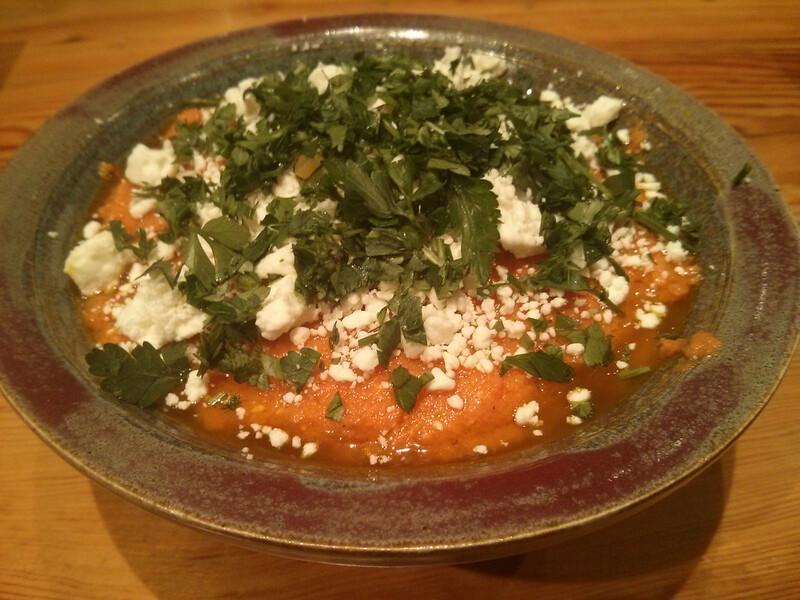 This is another recipe I'll make again just because it's so dead simple: you roast carrots in the oven with olive oil and cumin, and then puree them with a little feta. Here the salad is displayed in one of my own bowls, part of a nested set I gave my mother-in-law. Then we took a long break to get our appetites back, before starting on the second course.